Mahalo to each and every one of you who have become part of the social change effort represented by A PLACE IN THE MIDDLE. I hope that it will help you find the confidence, strength, determination, and fortitude to do what you need to do, whether simply to be yourself and live your truths, or to create an opportunity for empowerment and acceptance for someone who is without, just as my family did for me. My grandmothers, my mother and father, and others in my family empowered me to identify by culture first. In doing so, Iʻve found a very distinct and honorable place in which to exist. Iʻm very grateful for the lessons Iʻve acquired from all my mentors, teachers, and role models and am even more excited that these insights and lessons are able to live on via this film through you. The cultural empowerment that I hope you experience is a part of the collective wisdom my family and mentors imparted upon me, and now I leave it with you to give you confidence and strength for the paths and journey ahead. Thank you so much for bringing A PLACE IN THE MIDDLE into your classroom. 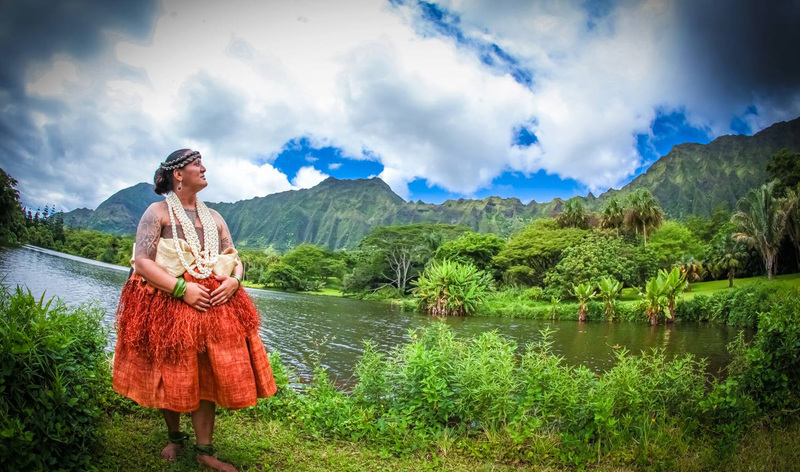 We are honored and grateful that Ho'onani and her teacher Kumu Hina Wong-Kalu allowed us to document their story and share it with you. With your guidance, the film can help your students appreciate the value of inclusion, the strengths they inherit from their cultural heritage, and their own power to create a school climate of respect and honor for all. This project started as a portrait of Hina. But when you commit to making a verite documentary based on the life of a strong character, you can never be sure exactly where the film will end up. That's certainly the case for A PLACE IN THE MIDDLE. When we met Hinaleimoana in early 201, we were immediately captivated by her presence. Physically large, and covered in striking tattoos, she is easily identifiable to most as a transgender Polynesian woman. But rather than being cast as an outsider, as would likely be the case in the continental United States or most other places, Hina is an important and popular person throughout Hawai'i. A graduate of the elite Kamehameha Schools and University of Hawaiʻi, she serves as Director of Culture at an innovative public charter school and as chair of a state commission overseeing the protection of Native Hawaiian ancestral remains. When out and about in Honolulu, young and old alike call out and wave to their kumu, or teacher, Hina as she is affectionately known. But what most compelled us to grab our cameras and begin to follow Hina was her brief mention of an upcoming trip to Fiji to pick-up her Tongan husband, a man she had married a year earlier but had to leave waiting while she returned to Hawai'i to get his immigration papers in order. We imagined that the trials and tribulations of this unusual Pacific Islander couple navigating the most universal terrain of the human experience – romantic love and marriage - would be fascinating, entertaining, revelatory. Indeed it was a powerful journey through love and heartbreak. But it was another, completely unexpected story that emerged during the year we spent following Hina that transformed our vision and hopes for this film. As a teacher at a Hawaiian values-based public charter school, Hina spends months preparing her students for a big end-of-year performance at which the community will see how well they have studied their culture and its practices. We were filming Hina daily while she worked with a group of high school boys, many who just didn't seem to get the essence of the masculine hula she was teaching them. Nothing seemed to work. Nothing, that is, until the day that Ho‘onani walked in the door and asked if she could join the troupe. Ho‘onani is a sixth grade girl who is very comfortable in her own tomboyish skin. Her friends nonchalantly say Ho‘o's a mixture of a girl and a boy and that it's no big deal. For a brief moment, Hina wondered if it would upset parents or other teachers if she let Ho‘o dance with the boys. But she knew that it was just such limited thinking, brought to Hawai‘i by missionaries nearly two hundred years ago, that made it so difficult for her to make her own transition from boy to girl back when she was in high school. Perhaps as a result of those painful experiences, Hina has made great effort to create a school environment where all kids are welcome and feel like they belong. Based on ancient Hawaiian values and traditional respect for māhū - those who embrace both the feminine and masculine traits that are embodied in each one of us - Hina has created a special “place in the middle” for students who might be marginalized and mistreated elsewhere. Ho‘onani thrives in that place in the middle. Coming from the continental U.S. - where our previous film, the Emmy Award-winning “Out In The Silence,” introduced us to the lingering anti-LGBT prejudice and discrimination in rural and small town America – and where openly-transgender teachers are few and far between, let alone respected, and where the idea of embracing and dignifying gender nonconforming kids is almost unimaginable, we were stunned and inspired by what was unfolding before our eyes and our cameras. So we let the cameras roll, following Hina and Ho‘onani through the ups and downs, trials and tribulations of their personal journeys, offering an inspiring glimpse of how being true to one's culture and oneself can be the key to overcoming lifeʻs biggest challenges. By the conclusion of the school year, it was clear that both of their stories were important and deserved to be told in a way that would make them accessible to a wide range of audiences, young and old alike. We are very grateful to our public broadcasting funders, the Independent Television Service and Pacific Islanders in Communications, for their support for the production of KUMU HINA and A PLACE IN THE MIDDLE. We could not have brought this work to you without the support of the Hawai'i People's Fund and the Ford Foundation for the education and engagement campaign. Finally, we are fortunate to have numerous partners who are helping get A PLACE IN THE MIDDLE to schools and communities far and wide, including PBS Learning Media, Teaching Tolernace, Gender Spectrum, Welcoming Schools and Frameline Distribution. Mahalo nui loa!